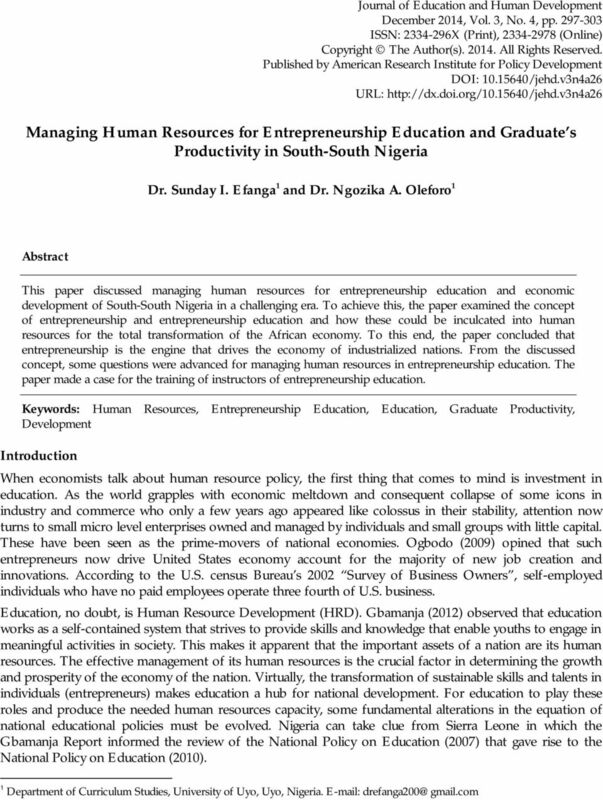 Download "Managing Human Resources for Entrepreneurship Education and Graduate s Productivity in South-South Nigeria"
1 Journal of Education and Human Development December 2014, Vol. 3, No. 4, pp ISSN: X (Print), (Online) Copyright The Author(s) All Rights Reserved. Published by American Research Institute for Policy Development DOI: /jehd.v3n4a26 URL: Managing Human Resources for Entrepreneurship Education and Graduate s Productivity in South-South Nigeria Dr. Sunday I. Efanga 1 and Dr. Ngozika A. Oleforo 1 Abstract This paper discussed managing human resources for entrepreneurship education and economic development of South-South Nigeria in a challenging era. To achieve this, the paper examined the concept of entrepreneurship and entrepreneurship education and how these could be inculcated into human resources for the total transformation of the African economy. To this end, the paper concluded that entrepreneurship is the engine that drives the economy of industrialized nations. 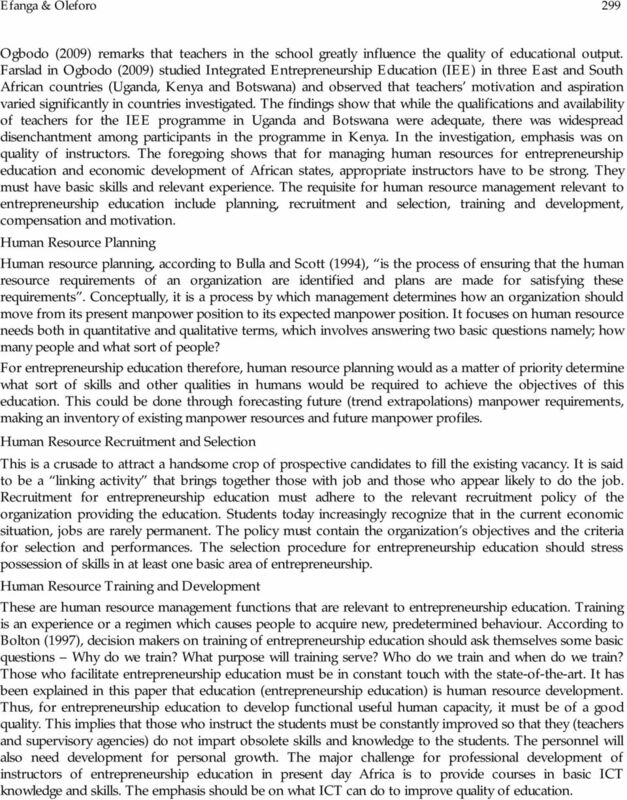 From the discussed concept, some questions were advanced for managing human resources in entrepreneurship education. The paper made a case for the training of instructors of entrepreneurship education. Keywords: Human Resources, Entrepreneurship Education, Education, Graduate Productivity, Development Introduction When economists talk about human resource policy, the first thing that comes to mind is investment in education. As the world grapples with economic meltdown and consequent collapse of some icons in industry and commerce who only a few years ago appeared like colossus in their stability, attention now turns to small micro level enterprises owned and managed by individuals and small groups with little capital. These have been seen as the prime-movers of national economies. Ogbodo (2009) opined that such entrepreneurs now drive United States economy account for the majority of new job creation and innovations. According to the U.S. census Bureau s 2002 Survey of Business Owners, self-employed individuals who have no paid employees operate three fourth of U.S. business. Education, no doubt, is Human Resource Development (HRD). Gbamanja (2012) observed that education works as a self-contained system that strives to provide skills and knowledge that enable youths to engage in meaningful activities in society. This makes it apparent that the important assets of a nation are its human resources. The effective management of its human resources is the crucial factor in determining the growth and prosperity of the economy of the nation. Virtually, the transformation of sustainable skills and talents in individuals (entrepreneurs) makes education a hub for national development. For education to play these roles and produce the needed human resources capacity, some fundamental alterations in the equation of national educational policies must be evolved. Nigeria can take clue from Sierra Leone in which the Gbamanja Report informed the review of the National Policy on Education (2007) that gave rise to the National Policy on Education (2010). 1 Department of Curriculum Studies, University of Uyo, Uyo, Nigeria. 2 298 Journal of Education and Human Development, Vol. 3(4), December 2014 There has been no consensus definition of the term entrepreneurship but most authors agree with Inegbenebor (2006) that entrepreneurship is about learning the attitudes, skills and competencies necessary to assume the risk of starting or establishing a new business. Kourilsky (1995) avers that the signature of true entrepreneurship is characterized by three attributes: 1. The identification or recognition of market opportunities and the generation of a business idea, 2. The marshalling and committing of resources in the face of risk to pursue the opportunity, and 3. The creation of an operating business organization to implement the business idea. This shows that entrepreneurship is the ability to create and build something from practically nothing. It involves initiating, doing, achieving and building an enterprise or organization. It involves the knack for sensing an opportunity where others see chaos, contradiction and confusion. It is the know-how to find, marshal and control resources and to make sure you don t run out of money when you need it most. Entrepreneurship is an important element in the dynamics of all economies and it is regarded as the driving force in economic growth and job creation (Sunter, 2005 and Ogbodo, 2009). One can easily observe from the above analysis of what entrepreneurship means that it is not uniformly distributed in any given population. Helping students to acquire the spirit and drive towards business start-ups would entail preparing them to become self-reliant and not job-seekers in the economy. In the same vein, it would make African states and economy entrepreneurial. In recent times, many ivy enterprises are downsizing and tens of thousands of people are being laid off. Babalola and Human Development Report in Anannagoon, Akudo and Emetaron (2008) assert that unemployment rate in Nigeria as at 2003 and 2004 were 12.40% and 15% respectively. Igbudu (2008) states that unemployment rate has risen to 60% between 2005 and This indeed is geometrical progression which, if left unchecked, is bound to stunt the growth of the nation economically and politically. Tertiary education can play a significant role in developing an entrepreneurial nation. This is informed by the fact that entrepreneurship education could be provided and received formally in colleges and universities. The aim would be to ensure widespread diffusion of entrepreneurial knowledge, skills and dispositions in African states. Who are those who will deliver this education to the youths at various levels? According to Ogbodo (2009), they are people who possess the skills required for entrepreneurship and they therefore constitute the pool of human resources for entrepreneurial education and economic development of African states. How will these teachers as human resources be managed to ensure the realization of objectives of entrepreneurial education? This is the focus of this paper. Human Resource Management Defined Human Resource Management (HRM) is a strategic and coherent approach to the management of an organisation s most valued asset; the people working there who individually and collectively contribute to the achievement of its objective (Armstrong, 2004). Human Resources Management in education (including entrepreneurship education) parlance is not only effective utilization of people per se at work but involves the harnessing of the totality of the people s skills, energies, talents, social characteristics like belief to achieve educational objectives and at the same time making people to be integral component of organization in fulfilling their life goals. Fombrun, Tichy and Derana in Armstrong (2004) explicitly presented workers (people) as key resource that managers use to achieve competitive advantage for their companies. It is crucial to manage human resources engaged in entrepreneurship education because without which its goals would not be achieved. Humans (the entrepreneurs) who posses these needed attribute are the foot soldiers who can do the work in the trenches today and lead the troops tomorrow for entrepreneurship education. The National Policy on Education (FRN, 2004) underscores this when it says that no educational system (including entrepreneurship education) could rise above the quality of its teachers. 3 Efanga & Oleforo 299 Ogbodo (2009) remarks that teachers in the school greatly influence the quality of educational output. Farslad in Ogbodo (2009) studied Integrated Entrepreneurship Education (IEE) in three East and South African countries (Uganda, Kenya and Botswana) and observed that teachers motivation and aspiration varied significantly in countries investigated. The findings show that while the qualifications and availability of teachers for the IEE programme in Uganda and Botswana were adequate, there was widespread disenchantment among participants in the programme in Kenya. In the investigation, emphasis was on quality of instructors. The foregoing shows that for managing human resources for entrepreneurship education and economic development of African states, appropriate instructors have to be strong. They must have basic skills and relevant experience. The requisite for human resource management relevant to entrepreneurship education include planning, recruitment and selection, training and development, compensation and motivation. Human Resource Planning Human resource planning, according to Bulla and Scott (1994), is the process of ensuring that the human resource requirements of an organization are identified and plans are made for satisfying these requirements. Conceptually, it is a process by which management determines how an organization should move from its present manpower position to its expected manpower position. It focuses on human resource needs both in quantitative and qualitative terms, which involves answering two basic questions namely; how many people and what sort of people? For entrepreneurship education therefore, human resource planning would as a matter of priority determine what sort of skills and other qualities in humans would be required to achieve the objectives of this education. This could be done through forecasting future (trend extrapolations) manpower requirements, making an inventory of existing manpower resources and future manpower profiles. Human Resource Recruitment and Selection This is a crusade to attract a handsome crop of prospective candidates to fill the existing vacancy. It is said to be a linking activity that brings together those with job and those who appear likely to do the job. Recruitment for entrepreneurship education must adhere to the relevant recruitment policy of the organization providing the education. Students today increasingly recognize that in the current economic situation, jobs are rarely permanent. The policy must contain the organization s objectives and the criteria for selection and performances. The selection procedure for entrepreneurship education should stress possession of skills in at least one basic area of entrepreneurship. Human Resource Training and Development These are human resource management functions that are relevant to entrepreneurship education. Training is an experience or a regimen which causes people to acquire new, predetermined behaviour. According to Bolton (1997), decision makers on training of entrepreneurship education should ask themselves some basic questions Why do we train? What purpose will training serve? Who do we train and when do we train? Those who facilitate entrepreneurship education must be in constant touch with the state-of-the-art. 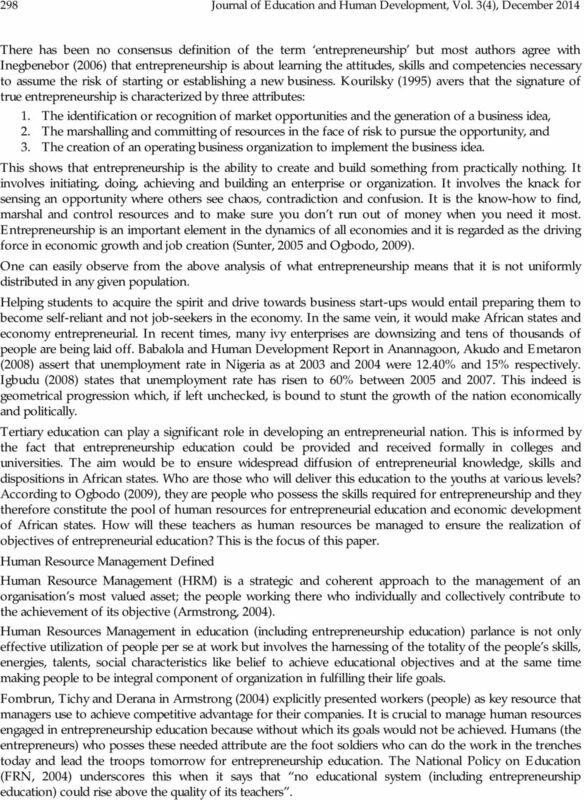 It has been explained in this paper that education (entrepreneurship education) is human resource development. Thus, for entrepreneurship education to develop functional useful human capacity, it must be of a good quality. This implies that those who instruct the students must be constantly improved so that they (teachers and supervisory agencies) do not impart obsolete skills and knowledge to the students. The personnel will also need development for personal growth. The major challenge for professional development of instructors of entrepreneurship education in present day Africa is to provide courses in basic ICT knowledge and skills. The emphasis should be on what ICT can do to improve quality of education. 4 300 Journal of Education and Human Development, Vol. 3(4), December 2014 The responsibility for this HRM activity rests with management, which formulates training and development policy and approves the budget. Importantly, they must also provide leadership in determining how the new technologies can best be used in the context of the culture, needs and economic climate within Nigeria. This resume set the stage for this academic debate. Statement of the Problem The government and individual rest their hope on education because of its externalities. The tertiary education that students receive does not appear to equip them with salable skills beyond those required for passing examinations. The curricula content do not appear to prepare students to relate their studies to their challenges and those the nation at large. This is evidenced by the magnitude of unemployed university graduates in the country. However, where these graduates are employed without training and re-training, they are found to be unproductive. This phenomenon has been linked to poor human resources management and most importantly irrelevant curricula and inadequate or poor state of the art work experience. Hence, the focus of this study is to determine if managing of human resources for entrepreneurship education has any relevance to economic development of South-South States of Nigeria. Hypotheses The following null hypotheses were formulated to guide the study: Ho 1 : Practical experience acquired in tertiary entrepreneurial training programme do not significantly relate to graduates productivity. Ho 2 : Curriculum contents for tertiary entrepreneurial educational do not significantly contribute to graduate productivity. Ho 3 : There is no significant influence of joint contribution of curriculum contents o f tertiary entrepreneurial program and practical experience acquired in the tertiary entrepreneurship training programme to graduate productivity. Methodology This study employed quantitative research design. Quantitative research involves those studies having data which can be analyzed in terms of numbers. The quantitative analysis for this study was obtained from data obtained from research instrument (questionnaire). The area of the study was the South-South Geo-political zone of Nigeria. The states in this zone are: Akwa Ibom, Bayelsa, Cross River, Delta, Edo and Rivers. The arrangement is based on alphabetical order and has nothing to do with political parties affiliation. The population of the study consisted of 8,030 entrepreneur Oriented National Youth Service Corp (NYSC) members in year 2013/2014 Batch B in the area of the study. Sample Characteristics The sample size consisted of 1,300 NYSC member (2013/2014, Batch B) randomly selected in the six states for the study. They were 750 males and 550 females. Instrumentation The instrument for data collection is the questionnaire, designed by the researchers. It was a 4-point rating scale instrument with the following response options: Strongly Agree (SA) 4 points, Agree (A) 3 points, Disagree (D) 2 points and Strongly Disagree 1 point. The reverse was the case with negatively word items. Validation of the Instrument The instrument for the study was subjected to face validation by three experts from Department of Educational Foundation, University of Uyo, Uyo. The corrected version of the instrument guided the structuring of the instrument. 5 Efanga & Oleforo 301 Reliability of the Instrument The reliability of the instrument was established by administering the instrument on 40 NYSC members in the state that did not take part in the actual study. Cronbach Alpha was used in determining the reliability of the instrument. The reliability coefficient of 0.87 was obtained. This was considered high enough for the use the instrument. Administration of the Instrument The researchers carried out administration of questionnaire through personal visits to participants in their orientation camps. This was done in an attempt to establish good rapport with respondents. The visit to each camp was done during official hours so as to meet participants in session. The sampled NYSC members were assured that their responses to be the questionnaire items were to treated with high level of confidentiality. Statistical Analysis Because of the sample size, data collected was analyzed using multiple linear regressions at 0.05 alpha level of significance. 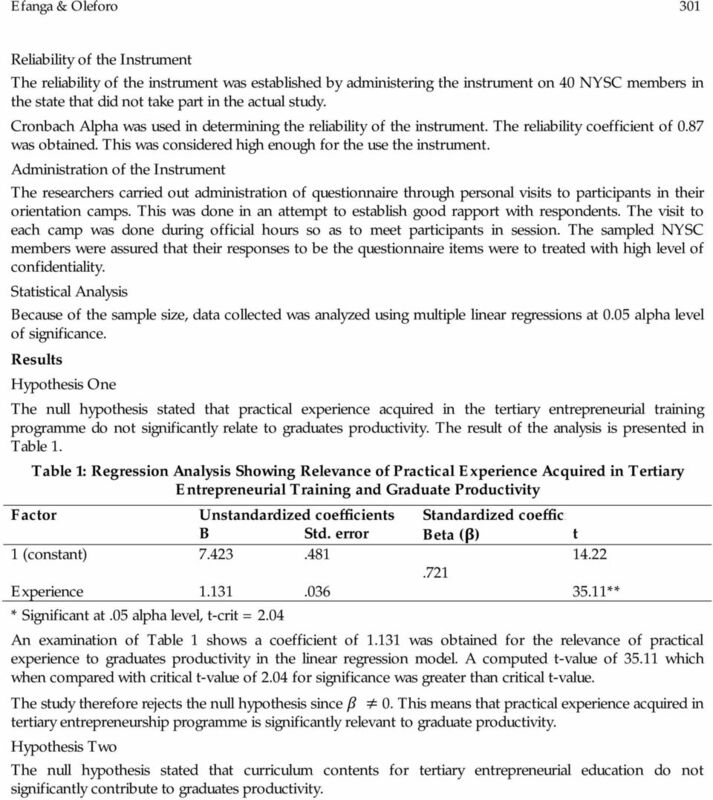 Results Hypothesis One The null hypothesis stated that practical experience acquired in the tertiary entrepreneurial training programme do not significantly relate to graduates productivity. The result of the analysis is presented in Table 1. Table 1: Regression Analysis Showing Relevance of Practical Experience Acquired in Tertiary Entrepreneurial Training and Graduate Productivity Factor Unstandardized coefficients Standardized coefficient B Std. error Beta (β) t 1 (constant) Experience ** * Significant at.05 alpha level, t-crit = 2.04 An examination of Table 1 shows a coefficient of was obtained for the relevance of practical experience to graduates productivity in the linear regression model. A computed t-value of which when compared with critical t-value of 2.04 for significance was greater than critical t-value. The study therefore rejects the null hypothesis since β 0. This means that practical experience acquired in tertiary entrepreneurship programme is significantly relevant to graduate productivity. Hypothesis Two The null hypothesis stated that curriculum contents for tertiary entrepreneurial education do not significantly contribute to graduates productivity. 6 302 Journal of Education and Human Development, Vol. 3(4), December 2014 Table 2: Regression Analysis of Curriculum Content for Tertiary Entrepreneurship and Graduate Productivity Model Unstandardized coefficients Standardized coefficient B Std. error Beta (β) t 1 (constant) Curricula contents ** * Significant at.05 alpha level, t-crit = 2.04 From Table 2 the regression reveals a coefficient of.325 has a contribution of curricula content to graduates productivity. A computed t-value of 11.2 was obtained. When compared for significance it was observed that the computed t-value was greater than the critical t-value also, since β 0, the study therefore reject the null hypothesis and retained the alternate. This finding therefore means that there is a significant positive relationship between the curricula contents and graduates productivity. Hypothesis Three The null hypothesis stated that there is no significant influence of joint contribution of curricula contents and practical experience on graduate productivity. Table 3: Multiple Regression Analysis Result on Joint Contribution of Curricula Relevance and Practical Experience to Graduate Productivity Model Sum of squares Mean square Df f Regression Residual Total * Significant at.05 alpha level, R = 0.805, R 2 = F critical = 3.09, N = 8030 Multiple regression analysis was used to examine the joint effect of curricula relevance and practical experience acquired in tertiary entrepreneurship training programme in South-South Zone of Nigeria. The result of the analysis is presented in Table 3. The coefficient of determination value (R 2 ) of was obtained. This indicates that 64.8% the total variation in graduates productivity was accounted for by the joint influence of practical experience acquired in the tertiary entrepreneurship training programme and the curricula contents. The computed F-value of at 0.05 alpha level was greater than the critical value of Hence the null hypothesis was rejected. This implies that there is a significant joint contribution of entrepreneurial contents of tertiary curricula and practical experience acquired in the tertiary entrepreneurship training programme to graduates productivity. Discussion of the Findings The findings from Table 1 indicated that there is a significant positive relationship between practical experience and graduates productivity. The obtained t-value of was greater than the table value of 2.04 at 0.05 alpha level. This finding agreed with Sunter, (2005) and Ogbodo (2009) who in their studies reported that entrepreneurship is an important element in the dynamics of all economics. This finding suggested that practical experience is the driving force in economic growth and graduates productivity. The finding in Table 2 showed a coefficient of.325 was obtained for the relevance of entrepreneurial contents of tertiary curricula to graduates productivity. The computed t-value of was obtained, which was greater than critical t-value of 2.04 at.05 alpha level. The implication of this finding is that entrepreneurial contents of tertiary curricula significantly contribute to graduates productivity. 7 Efanga & Oleforo 303 This result is consistent with the finding of Bulla and Scott (1994), who observed that for entrepreneurship education, human resource planning should as a matter of priority determine what sort of skill and other qualities in humans that would be required to achieve objectives of education. Curriculum should be designed to make learner acquire relevant entrepreneurial skills. The result in Table 3 shows that the coefficient of determination value of (R 2 ) = was obtained. This implies that 64.8% of the total variation in graduates productivity was attributed to joint contribution of entrepreneurial contents of tertiary curricula and practical acquired in the tertiary entrepreneurship training programme. The obtained f-value of shows significant at 0.05 alpha level. This finding provide answer to Bolton (1997) as to who do we train and when do we train? Those how facilitate entrepreneurship education must be in regular contact with the state-of-the-art. 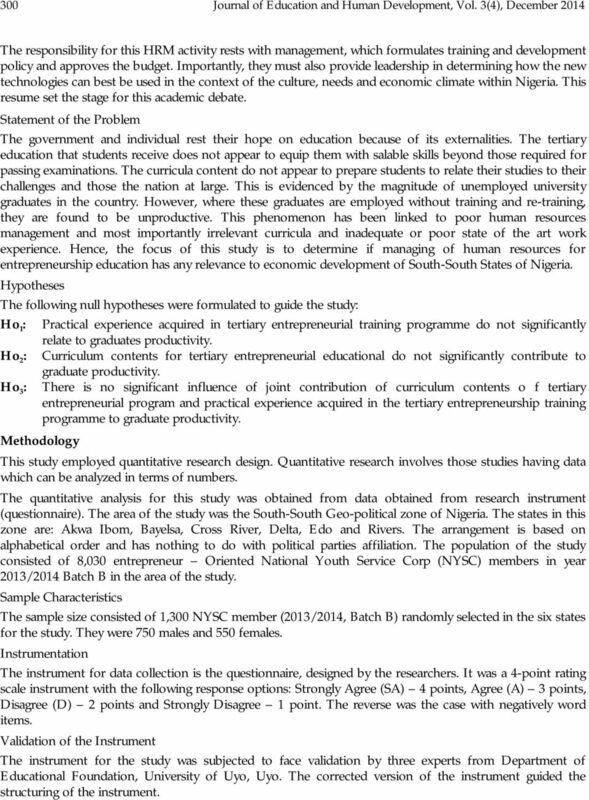 Conclusion Given the outcome of this study, it was therefore concluded that tertiary institutions provisions of entrepreneurship education as perceived by NYSC Batch B of 2013/2014, curriculum contents and practical experience are significant joint predictor of graduates productivity. Recommendations Based on the findings of this study, the following recommendations are hereby proffered; 1. That, for entrepreneurship education to develop functional useful human capacity, it must be of a good quality. 2. That National University Commission (NUC) should make it mandatory for faculties offering professional causes to encourage students participation in practical works. 3. Curriculum contents of entrepreneurship education should be developed to suit the state-of-the-art. References Anannagoon, B., Akudo, F. and Emetarom, U. (2008). Students perception of entrepreneurship education in higher institutions and poverty alleviation for sustainable development in Abia State, Nigeria. A paper delivered at the 2008 International Conference of the National Association for Educational Administration and Planning (NAEAP) (23 rd 27 th September). Armstrong, M. (2004). A handbook of human resource management practice. India: New Delhi. Bolton, T. (1997). Human resource management: An introduction. Cambridge, Massachusetts: Blackwell Publisher Ltd. Federal Government of Nigeria (2004). National policy on education. Lagos: NERDC. Gbamanja, S. P. T. (2012). Education and human resource development in Africa. A paper presented at the International Conference of National Association for Research Development (NARD), University of Uyo, Uyo, Nigeria. Inegbenebor, E. C. (2004). Entrepreneurship and female youth knowledge, perceptions, gender differences and educational practices. Journal of Business, Vent (13), Ogbodo, C. M. (2009). Managing the human resources for entrepreneurship education. A paper presented at the 1 st Annual Conference of National Association for Educational Administration and Planning (NAEAP), University of Port Harcourt, Nigeria. Sunter, C. (2000). Entrepreneurship holds the key to SA s future. The SMME Tabloid, February 23. Agnes W. Gathumbi a & Paul Nyagorme b Kenyatta University, Kenya a University of Cape Coast, Ghana b Corresponding Author: agnesgath@gmail.